The second edition of the International marimbacompetition, Belgium 2004 was held August 20-27 in the beautiful sounding wooden ‘academiezaal’ in the town Sint-Truiden, near Brussels . (A festival was held in conjunction with the competition showcasing clinics and concerts by the jury members, finalists 2001 & extra guests). Eighty seven solo marimbists and twenty five marimba duos competed. 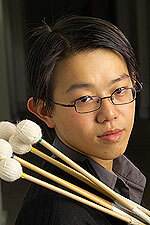 For marimba solo 3 final prizes were given to: Eriko Daimo (Japan-1 st laureate), Noriko Tsukagoshi( Japan-2 nd laureate) & Chin-Cheng Lin (Taiwan-Belgium -3 rd laureate). 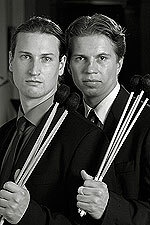 For marimba duo the first prize was given to Johan Bridger & Patrick Raab (Sweden-1 st laureates). The second prize was given toElwira Slazak & Gabriel Collet (P/F-Belgium- 2 nd laureates) who also obtained immediately after the Belgian competition the first prize at the Penderecki competition in Poland. The event’s artistic director and founder of the competition Ludwig Albert assembled the other jurors: William Moersch (USA), Emmanuel Séjourné (F), Angel Frette (Arg), Momoko Kamiya (J), Bogdan Bacanu (Au) & extra jurors for the Semi & final round Leo Ouderits (B) & Jan Pustjens (NL), maestro Zefferino Nandayapa (Mex), Jan Van Landeghem (B), Eckhard Kopetzki (D) & maestro François Glorieux (B). From 4 nominated candidates the extra ‘Young Talent Prize’, was finally given to Min Jeong Song( Korea -17 years) and finalist Chin-Cheng Lin (Taiwan-Belgium-19 years) for their exceptional talent and musicality. 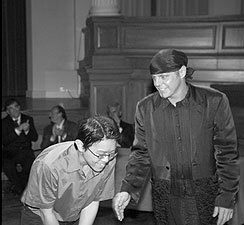 The originality prize (publications of own composition or arrangement by Beurskens Music Edition) was given to Taiko Saito (J-D) and Zhengdao Lu ( China ). Concert platforms offered by Classic Concert (Au) were given to Peter Korosin. 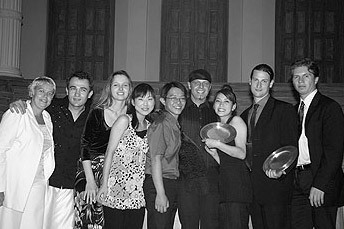 Showcase concerts at the PASSIC 2004 and the Belgian marimba festival edition 2007 were given to the first prize laureates. 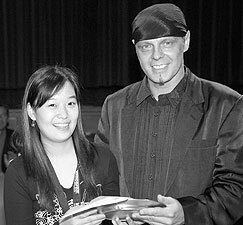 The award of honour 2004 was given to following artists for their tremendous contribution in the marimba & percussion field: Keiko Abe (J), Zefferino Nandayapa , Jan Pustjens & Mol Percussion Orchestra (B).